Objective – The learner will be able to draw an ocean scene depicting the biggest thing in the ocean. 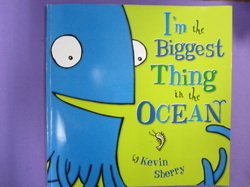 Procedure – Read the book I’m the Biggest Thing in the Ocean by Kevin Sherry. Discuss the difference between a landscape, ocean scape, and cityscape. Model drawing the fish and plants in the ocean. Students outline objects with sharpie markers and then paint with watercolor.